It has been my pleasure to write many articles pertaining to the America’s past and the Old South land loving called ‘Dixie’ for your reading enjoyment for over 10 years. Thank you to the editors of newspapers and on-line folks who have been so kind to publish my letters. One month ago I was admitted into the hospital and diagnosed with Lymphoma Cancer. Today, through the good doctors and nurses with God and Jesus and family beside me, I am doing much better, doing therapy that will lead me back to good health and ready to write many more articles like the following as long as you the reader enjoy reading them. Remember, people of all races can be proud of their Christian, Southern, Confederate and American Heritage. God bless you, my American family and God bless people of all people who are or wish they were free. And, now for a good Irish-American story! Jefferson Davis President of the Confederacy was of Welsh and his Mother Jane Cook of Scotch-Irish descent. A lot has been written about the 150,000 Irishmen who fought for the Union during the War Between the States but do you know about the 30,000 equally brave Irishmen who fought for the Confederacy? It is written that by population a comparable number of Irishmen fought for the Confederacy as did those who supported the Union. Tuesday, March 17, 2015 is Saint Patrick’s Day and it’s also the 187th birthday of Patrick Ronayne Cleburne. Did you know the Confederacy’s units included the 10th Louisiana and the 10th Tennessee Infantry which was formed at Fort Henry in 1861 and defended Fort Donelson before becoming part of the Army of Tennessee? Who was Patrick R. Cleburne? He was only eighteen months old when his Mother died and a young fifteen when his Father passed away. He tried to follow in his Father’s footsteps, Dr. Joseph Cleburne, in the field of medicine but failed his entrance exam to Trinity College of Medicine in 1848. He immigrated to America three years later with two brothers and a sister and made his home in Helena, Arkansas. Cleburne, like many Southerners, did not support the institution of slavery but chose to serve his adopted country out of love for the Southern people and their quest for independence and freedom. In 1864, he advocated the emancipation of Black men to serve in the Confederate Armed Forces. Cleburne participated in the Battles of Shiloh, Richmond, Perryville, Stones River, Chickamauga, Missionary Ridge, Ringgold Gap and Franklin. He was killed at the Battle of Franklin, Tennessee on November 30, 1864. "If this cause, that is dear to my heart, is doomed to fail, I pray heaven may let me fall with it, while my face is toward the enemy and my arm battling for that which I know is right." Cleburne was engaged to Susan Tarleton of Mobile, Alabama. On March 17, 1979, Cleburne’s birthday, I proudly organized the Gen. Patrick R. Cleburne Camp 1361 of the Sons of Confederate Veterans in Jonesboro, Georgia which is still active. 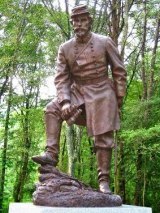 General Cleburne is buried in Maple Hill Cemetery in Helena, Arkansas. A good book: “A Meteor Shining Brightly” Essays on Maj. Gen. Patrick R. Cleburne” --edited by Mauriel Phillips Joslyn, is a good source of information about Cleburne. Calvin Johnston Jr. is a speaker, writer of short stories, author of book “When America stood for God, Family and Country” and Chairman of the National and Georgia Division Sons of Confederate Veterans Confederate History and Heritage Month committee. http://www.facebook.com/ConfederateHeritageMonth. He lives in Kennesaw, GA, a suburb of Atlanta.